Accessorize your generator with…. Two Wire Auto Start Control for off-grid solar backup generator. Solar power is a great idea when the sun’s shining. You can use your appliances safe in the knowledge that your solar panels are collecting power from the sun and converting it into electricity. Auto Start Generators are the best type of generator to backup your residential or commercial off-grid solar system. But what happens when the weather turns for weeks on end and the battery charge runs out? If you’re off the grid, it’s only a short step to a total blackout. 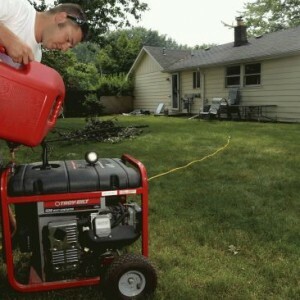 Thankfully, someone already thought of that and invented a range of generators that can be customized to save the day. The solution is a generator customised with a 2-wire auto start. The two-wire auto start generator is the best solution to automatically top up your off-grid solar system. This article focuses on the options around auto start generators suited to automatically backup off-grid solar sets ups. Solar panels generate power all day, storing it in batteries, and then supply that stored power to your connected home. However when the weather turns and the solar panels are no longer creating energy, your household starts using the power that’s been stored in the battery, and the charge level gets lower and lower. The two wire auto start controller is connected from a portable or standby generator to the off-grid solar system control panel, external to the generator. 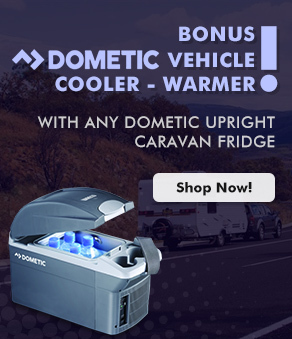 This detects when the deep-cycle battery charge is low and hey presto – it automatically starts up the generator to charge up the battery pack. It then automatically stops once the battery charge levels are topped up. Why choose a 2-wire auto start? A generator with a two-wire auto start option means you get all the benefits of solar power with the peace of mind that there’s backup generator power on demand. So if you get a prolonged period without decent sunlight to charge your solar set up, you’ll never be without power as the backup generator will have you covered. Pramac Diesel Generator with Auto Start: for backup to mains power or backup to off grid solar systems. Just as when you’re using a generator normally, the generator provides its own safety protection, such as shutoff for low oil level, overheating, and so on. But just because it starts automatically doesn’t mean you should neglect maintenance of the generator. Be sure to do all the important checks on a regular basis: inspect the fuel line for cracks and replace it if necessary. Refill the tank with fresh fuel and run the generator, plugging in some appliances to check it’s working properly. And if there are any problems, take it for repair so it’s ready when you need it most. Each auto-start generator comes with a maintenance guide in the product manual. An auto start generator can be complemented by adding a 2-wire auto start controller or some units have this built in already. This two wire device is required for solar backup generator applications. Another typical extra is a Automatic Mains Failure Panel (AMF) which is used when connecting a auto start generator directly to your house to provide mains backup power. The AMF (also known as an Automatic Transfer Switch) is designed to be wired into your home or office’s main switch board for direct power back up in the event of a blackout…the AMF is not relevant for those running their home with a solar set up. So just to be clear; for Solar set ups, you’ll need a 2-wire auto start controller to go with your auto-start generator (either an additional accessory, or built in to the auto start generator). For direct automatic back up to mains power (not solar) you’ll need an Automatic Mains Failure Panel (AMF) to go with your auto-start generator. In each case, installation of the generator and associated device is required to be undertaken by a qualified electrician. For backup generator options (both manual and automatic) to mains power (i.e. not off-grid solar sets), you can read this article HERE. Generators with a 2-wire auto start capability suited to off-grid solar back up range in price from just over $2,000 up to around $10,000 depending on the functions and size you need. One manufacturer worth checking out is Pramac, which has a large selection of generators (size and type) designed for 2-wire auto start capability. This brand is headquartered in Europe (Spain & Italy) and is renowned for its overall quality. Other popular options include the Powerlite Remote Start 8kVA generator ; assembled in Australia and powered by Honda, priced under $4,000. The Kubota Lowboy models are the choice for customers wanting Diesel; Kubota is one of the leading diesel engine manufacturers globally and their Lowboy Generators come fitted with Deep Sea Two Wire Auto Start Controllers ready for off-grid solar connection. Another auto-start generator brand which is new to Australia is Generac; these are gas powered generators, and whilst can require additional installation certification from the outset to connect to mains gas, they are starting to gain significant interest in the market; they can be a more cost effective option compared to petrol and diesel and the units self-test automatically. Can be used to backup solar set ups, but mostly chosen for backup to house mains during blackouts. 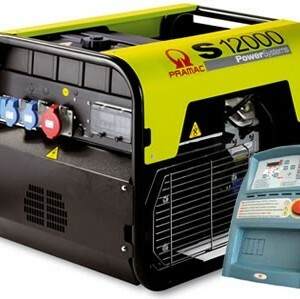 The most popular auto start generators for solar backup are the Pramac range, Powerlite and Gentech (affordable 8kVA Petrol models), Generac (Gas powered), and Kubota (best Diesel sets). Pramac has the largest choice of auto start models and designs and they manufacture robust units to suit both domestic or commercial solar backup power requirements. 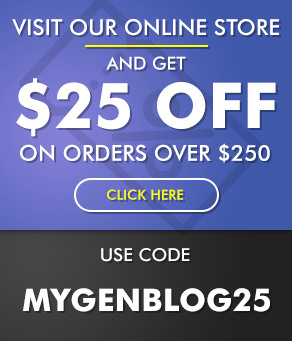 The Powerlite and Gentech models are the typically the most cost effective. The Generac Gas sets are excellent auto start generators, but they are not used as commonly for off-grid solar backup; they are more popular for mains power backup. The Kubota Lowboy models are especially popular for rural or bush properties where diesel machinery is preferred over petrol. My Generator stocks sizes ranging from 5kVA up to 12kVA in the portable auto start range, with petrol and diesel options available, using world class engines such as Honda, Yanmar, Kubota and Lombardini. 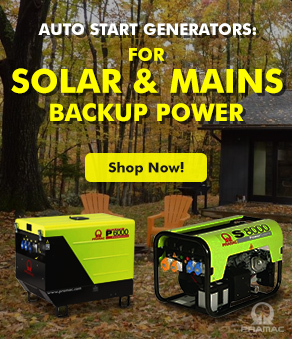 My home runs off solar and I’m looking at an auto-start generator; can you confirm the connection type I would need to link the generator to my solar batteries? There seem to be a number of connector type of accessories associated with this type of generator. Hi Rory – The accessory you require a Two-Wire Auto Start Controller; This device would connect between your auto-start generator and to your battery pack via the inverter. When your deep cycle batteries run low, the controller will detect this and signal for the generator to automatically kick in so you will not be without power! The auto start controller also signals to the generator when to stop. Thank you. Thanks for your reply Steve. It appears from the info contained in the article you gave me the link too I will require both a 2 way auto start and an AMF panel. I do not know if the generator I have has a 2 way auto start. Would you know if it does from the configuration info I gave you? I can send pics of it if you like. If it does not, can it be retrofitted? If so, do you sell the necessary gear/parts etc. Can it be fitted by a competent electrician? Similarly do you sell the AMF panel etc? No problems Tony – just to be clear, for your generator to work automatically in conjunction with your solar set up, you will need a two wire auto start generator and a two wire controller. As we are not familiar with the generator model you currently have, it is best to contact the manufacturer to see if two wire capability can be fitted. Do I need a two-way auto start if I manually start my generator upon loss of grid power? I have a 15KW generator which I’m using for power outage. Recently, I installed a 13KW solar panels and plan on using the generator to provide the necessary voltage and frequency to run the solar PVs. Is there a problem with this? Hi Augusto – no, a two wire auto start automatic generator is not required if you intend to start it manually. The auto-start generators and accompanying controller are popular for solar back up as the generator and controller will automatically detect when the batteries require topping up. But if you want to monitor it yourself and manually start a generator that is suitably connected to your solar set up, then you can do that. In terms of whether your particular generator can be connected to your solar set up for backup, you would need to talk to an electrician/solar installer to make sure you have the appropriate voltage, connections, controllers etc. how many amps is on output Pramac 6kVA, my charger and regulator have Maximum output current 65A ? Whether there are calculations how powerful generator needs to be for solar system ? I have a manual AUX/Mains switch and plug to connect generator, it was installed when house was built – but I’m not clear if when I attach a generator whether I have to turn off the solar system to isolate it, or the solar inverter, from the circuit during change over from mains to genset or vice versa? And should solar system be isolated when genset is running? Hi Hugh, always good to run this question past a solar installer for your particular set up, however in our experience regarding power isolation; if you are on mains power and solar (feeding back into the grid), then this is considered one power source and the generator a separate power source. So, during a mains blackout, you would use the manual transfer switch to switch over to the generator power supply, thus isolating your mains/solar power supply. Thanks. 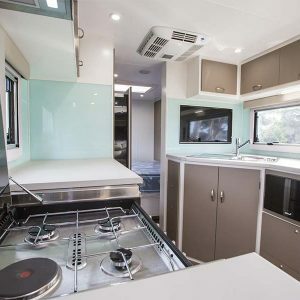 Looking for an auto-start generator for a weekender and don’t have solar or mains power, so wondering what solutions are available that will automatically start the generator up when something tries to draw power? ie, fridge compressor starts, wanting a solution to detect the power draw and automatically start the generator and stop again once the fridge stops. Does it need an inverter type system with a battery to work in this way? Hi Chris, I’m not aware of a generator that automatically starts up based on an appliance starting or stopping. The way our auto-start generator models work is that either a Two-Wire Controller or AMF (Automatic Mains Failure) Panel detects either the solar system batteries or the mains power system requires power, and signals to the generator to start up and provide this power requirement. In your case, if you are running your appliances from batteries, then you could speak to an electrician about configuring a two-wire auto start generator to automatically top up your batteries when required (much like an off-grid solar set up). Feel free to give our team a call if you’d like further help: 1300 400 122. Many thanks. Looking for a generator to assist with build off grid then use as backup for solar system. Thinking Gentech 8kVa auto start, would this unit have to be hard wired to use as backup once solar and battery system is installed as would prefer flexibility of having it portable to use around property? 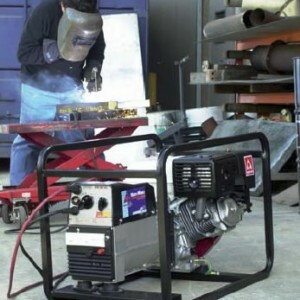 Hi Adrian, The Gentech Honda 8kVA Auto Start Generator model comes standard with 2 x 15A outlets. The solar (battery charger) could be setup to plug into one of these outlets which would then be able to be unplugged. The 2 wire remote connection however would have to be setup with a “disconnect point” between the generator & the solar controller if you want to be able to move the unit, which can be discussed with your solar installer/electrician upon installation. Many people will use this type of auto start generator model for exactly the dual applications you are describing, i.e. 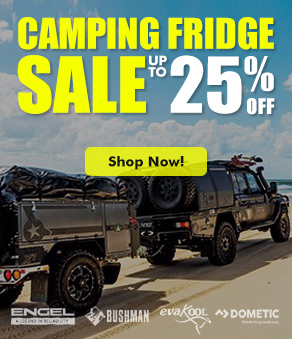 primarily for solar back up, but also for portable power requirements as well. Please give our team a call on 1300 400 122 if you would like any more information. A usual installation is as follows. Solar panels are putting charge into batteries and keeping them at a high level of stored power. Hi Gerry – typically generators that are used for your described application have that two wire auto start capability built in. However some users do get an electrician to retro fit a standard electric start generator to have that two wire auto start capability, so this could be an option for you. Hello, can you please advise if a genny with a 2 wire auto start can be programmed to come on? We have just had a situation where the genny which has just been installed started running, when no solar power was in use. (House empty and unoccupied at this point.) We are trying to work out why it came on. Most two wire auto start control panels are waiting for a signal from another device. They work on a open or closed circuit. Once the circuit has closed a signal is received by the generator and it will start. In the case of back up for off grid solar, the Inverter / Charger is generally programmed to send a signal to the generator to start up. The parameters in the Inverter /Charger can be changed to meet your needs. You may need to check on those settings. I hope this helps your situation. 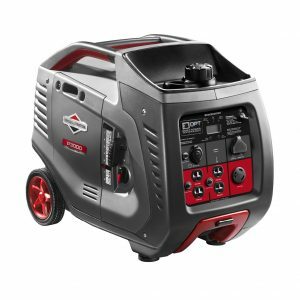 Briggs and Stratton Generator Review: Do They Stack Up?